Jeff Sinelli serves as Founder, CEO, and Chief Vibe Officer of Which Wich. He often says, “Anything is possible.” That includes creating and growing an iconic brand, both domestically and internationally, to 300 locations in 10 years, and spreading a lot of positive vibes along the way. Sinelli grew up in Detroit, and after achieving a BA at a Michigan State and an MBA from City University, Sinelli headed west to exercise his entrepreneurial spirit in Dallas. In the mid ‘90s he developed several independent restaurants and nightclubs before focusing on building multiunit concepts. In 1998, Sinelli created Genghis Grill, a Mongolian Barbecue restaurant, which he grew to 11 units in five states. It was awarded the prestigious Hot Concept! Award by Nations Restaurant News in 2002. Sinelli sold the concept in 2003, and set to work on filling what he felt was a void in the sandwich arena. 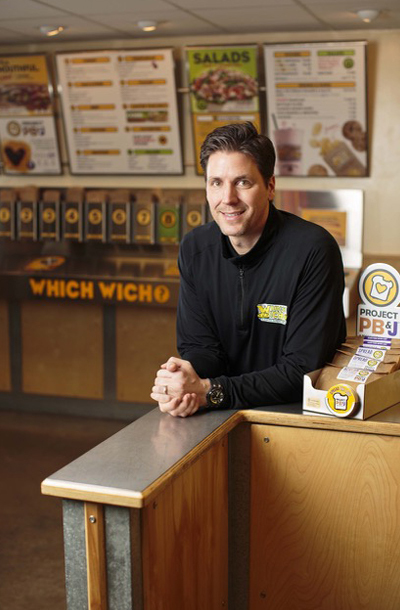 Sinelli created Which Wich in 2003, prompting QSR Magazine to refer to him as a “branding phenom” upon its launch. Which Wich was a huge hit from the moment it opened its doors, and due to the demand for franchise opportunities, the company began awarding franchise rights in 2005. By 2013, Which Wich has expanded throughout the United States, and has opened locations in Mexico, Panama, Qatar, and Dubai, with over 100 more locations in development. In his spare time, Sinelli enjoys spending time with his wife Courtney, his daughters Story and Sky, and his Labrador, Moonlight. His hobbies include tennis, golf, lacrosse (he played for the Detroit Turbos in 1990-1992), travel, and Conscious Capitalism activities. In October 2013, Which Wich launched Project PB&J, a charitable endeavor that donates PB&J sandwiches to people in need. The goal of the project is to “spread the love,” one PB&J at a time.